There are a lot of good things happening with this book both inside and out. All of the X-titles have new logos on their covers as part of X-Men: Regenesis courtesy of designer Jared Fletcher. This was the first time I’d really looked at his New Mutants logo and I like it a lot, particularly the alignment of the “W” and “M” and the incorporation of an “X.” I also appreciated the “moving” theme of Jason Pearson’s cover image coming out of X-Men: Schism and its slight misdirection. Spoilers for New Mutants #33 will follow. The cover provided a nice twist as the team did move, but not all the way to Westchester with Wolverine’s team. While Cannonball and Karma (with Face) did elect to head back East, the team we’ve been reading about since writers Danny Abnett and Andy Lanning took over the title is staying on the West Coast. While the book is light on action, I really appreciated the writers’ take on the split between Cyclops and Wolverine, pointing out that the ideals of defending the children or defending the species require a bit of separation from the real world. Their choice to base this squad in San Francisco rather than Utopia is a good one that should give the characters a lot of room to interact with the citizens of the Marvel Universe. David and Álvaro Lopez’s art throughout the issue is very strong. I’m not terribly familiar with the work of David Lopez (best known for co-creating Fallen Angel with Peter David), but I do recall liking his work on Hawkeye and Mockingbird in their recent series as well as New Avengers: The Reunion. Thankfully, Regenesis hasn’t really changed much of how Abnett and Lanning are handling this book and its characters, but they do get a new home in San Francisco and a solid new art team. I like these characters and I’m particularly happy to see Nate Grey in the cast and interacting here with Hope Summers. The search for Blink next issue promises more excitement moving forward considering she was last seen as an agent of the villain Selene during Necrosha. 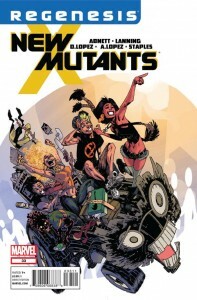 Even though I didn’t always follow the original New Mutants series, I’ll be sticking with this one. Read more about X-Men: Regenesis on MyLatestDistraction. and keep up with our reviews as each of the X-titles enter this new era.